Another popular workbook curriculum program is Alpha Omega Lifepacs. This curriculum is part of the Alpha Omega Publications which also includes Switched on Schoolhouse, Weaver Curriculum, and Horizons. They are all Christian curriculums based on master learning which means that they master the content and skills before moving on to a new concept. The Alpha Omega Lifepacs offer five core subjects for grades K-12 plus electives. Basically the student uses ten small colorful workbooks for each subject for the year. They can move through these workbooks quickly, usually finishing them in 3-4 weeks. They don't have big heavy textbooks to haul around the house. The workbooks include text, lessons, activities, review questions and tests. There are projects and lab activities to help reinforce the concepts learned using more than just a textbook approach. If you're not sure where to start your child in Alpha Omega Lifepacs, there are diagnostic tests that help with placement. In the program there are self tests and teacher checkpoints for each subject. Many times these little booklets are motivational for the student because they enjoy completing the books and getting the feeling that they are getting something accomplished. There are scripture passages throughout the books reinforcing biblical concepts. Once your student gets into second grade and beyond, the workbooks are more self teaching. The student can work at their own speed and parents have an easier time tracking progress. They can put a goal completion date in the back of each workbook and see whether their child is staying on track. The complete curriculum package comes with 10 workbooks and teacher guide and is fairly affordable for most people at $200-300 per year per student. You can also pick and choose subjects and don't have to use the complete program. As with any curriculum, if you look very far on the Internet you will find people who love it and people who hate it. The best thing to do is to research the program as much as possible and know what is included and what is not. Then mix that with what you know about your child (along with a lot of prayer) so that you can make the most informed choice for your child. good for students who get distracted by busy pages. These are simple and straightforward. not good if you use an eclectic style or want to make your own lesson plans. It seemed that people whose children started with Alpha Omega had a much more praise for it than those who jumped in at a later grade. I guess you get used to what you start with. 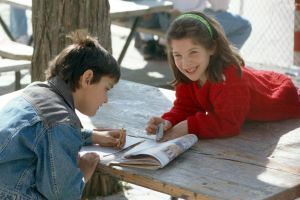 If you're not sure whether your child will like this or not, you can learn more about their learning style by doing a learning style assessment or reading about learning style and getting a better idea of how they learn best. God will guide you in the curriculum or books that you should use for homeschooling if you just ask Him and follow the path He sets before you. There is no formula for homeschooling just as there is no formula for parenting or anything else in life. Keep trusting what you know is right for your family. If you're looking for a more computer driven curriculum from Alpha Omega, you might want to look at my Switched on Schoolhouse review or AOP Monarch their new online curriculum.